All2MP3 is a free, super-simple audio converter that can help you change a wide variety of file formats into MP3s. All2MP3's interface is a simple drag-and-drop window, with an optional "Add" button if you want to browse for files. You can convert everything from WAVs and AIFFs, individually or in batches, just by dragging them onto the All2MP3 window. You quickly get a progress status bar, giving you options for quality (from "Less" to "Super") and the capability to automatically trash files after conversion. By default, All2MP3 puts the converted files into the source folder. Don't be fooled by the name: All2MP3 can't convert every kind of format to MP3 (such as iTunes' M4As), but it can convert quite a few, including APE, MPC, WMA, FLAC, WAV, and OGG. If you're looking for a quick, reliable, no-cost conversion utility, All2MP3 fits the bill. 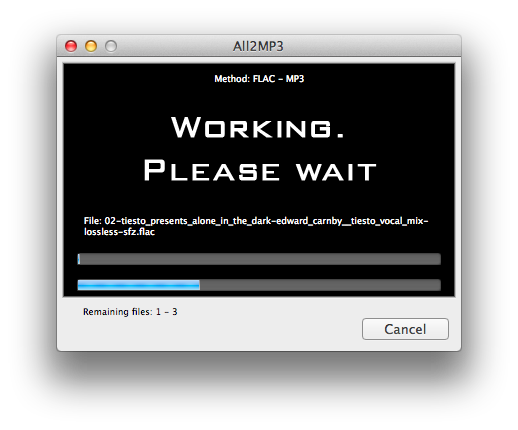 Convert FLAC to MP3 on Mac - Converting FLAC and other audio files with All2MP3 for Mac. If you need more information please contact the developers of All2MP3 for Mac (TresRRR), or check out their product website.